As announced in June 2016 the Namibian Educational Trust is partnering with the New Zealand and Namibian Governments to advance our project in Ehomba, Northwest Namibia. The two building projects we proposed have been approved by both governments. The first project is the food hall and kitchen which we have worked hard toward for so long. 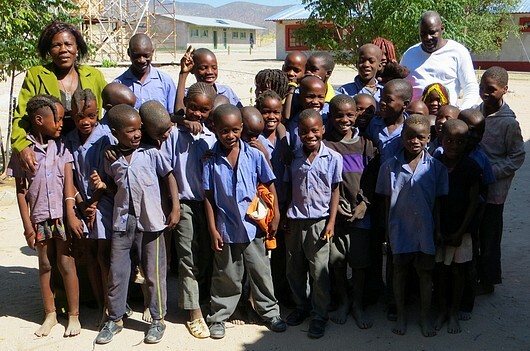 When completed it will enable the children to have three meals a day as the school will then be on the Namibian Government's food in schools program. Following many discussions and deliberations building is about to start. We look forward to updating you on progress. The food hall and kitchen are now fully funded by the New Zealand Government, the Namibian Government and the Namibian Educational Trust. The second project is too build extra teacher accommodation. As the role and the grades taught at Ehomba increase, the requirement for more and better trained teachers has become urgent. Currently some of our teachers are living in washhouses and an old armoury and Ehomba now needs better teacher accommodation urgently. We have 2/3 of the money required from the New Zealand Government Partnership Project fund. Currently we have raised NZ$30,000 towards the NZ$120,000 required . If any of our supporters are keen to assist us in bridging this gap, we would be immensely grateful. As soon as we achieve this target building can get underway. Our objective is to raise the extra NZ$90,000 by the end of August 2017, so that when the builders are constructing the food hall they will be able to complete the extra teacher accommodation as well. The logistics of getting builders to Ehomba is challenging because of its remoteness and the costs associated with each building project is higher than normal because Ehomba is 1,000 kilometers north of Windhoek, the capital of Namibia. These added complexities are always present in every aspect of our project but it is so worthwhile as the Himba and Owambo children begin their learning journey. If you can help please email Burton Shipley at burton@jsnz.com . The details of how you can donate are on the website or Burton will reply directly to your email. The Trust are delighted to advise that Jolly Phonics, the reading and maths program that we have used at Ehomba School for nearly 10 years, has now been adopted by the Namibian Government to be trialed in 8 different regions of the country. We have used Jolly Phonics very successfully with our children who have gone from very low levels of achievement to well above the National average. Our Trust has trained a large number of teachers not only in Ehomba and surrounding districts but also across the Northwest region of Namibia. The results that these trained teachers have achieved with their children have been outstanding. We are grateful to Chris Jolly of Jolly Phonics UK, for his generous support of our Trust and the work we have done in the Kunene Region of Namibia and now for his support of the Namibian Government's trial. This is a great to the development of Namibia and their children. We will let you know as soon as we hear how the trial goes and whether the program is adopted on a permanent basis in all Namibia. 2016 has been a highlight for the Trust. The NZ Government's Partnerships for International Development Fund invited us to apply for project funding and has granted extensive funds to build a food hall and also to improve the teacher accommodation at Ehomba. The Partnership Fund is providing two thirds of the cost for the foodhall and kitchen and we have successfully raised the other third from the Namibian Education Ministry and our fundraising. For the teachers accommodation, we are actively fundraising for a further NZD $100,000 to complete this part of the project. This critical facility will allow Ehomba to attract top quality teachers to expand the school to Grade 10 and continue to develop it as a centre of regional excellence. To offer some context, of the nine teachers who currently live at Ehomba School one lives in the old laundry and another lives in a former amoury so the need for new facilities is very clear. The Partnership Fund will also provide for a 4 year programme of planned teacher development. This is a small but very important part of the project as it will provide a lasting legacy of improved teaching capabilities for the benefit of students. It will also mean that the region will have a dedicated local teacher Development Officer. Each year generous donors continue to support our project. Burton and Jenny often accept speaking engagements on the basis that the organisation makes a donation to the Namibian Educational Trust. We raise around NZ$15,000 each year through this avenue. It allows us to support the ongoing extra-curricular activities of the learners, for example allowing them to travel to regional sports events, to have extra resources in their classroom, to provide sports equipment which is far beyond the means of their local families and the education funding system. We are also able to provide teacher support and text books, including library books and technology, which again is not available to all schools in Namibia. We are grateful for the support and the opportunities to raise funds in this way that will allow the Namibian Educational Trust to flourish. Mr and Mrs Zuana continue to provide inspirational leadership to the teachers at Ehomba School. There have been significant changes and we are attracting more qualified teachers to inspire the learners. This has required significant investment in text books and in 2016 we have spent over NZ$10,000 supporting Mr Zuana getting the types of materials required to allow our learners to achieve at the National Standard that they desire. Again great progress, great leadership and great engagement. Alexia Zuana continues to lead many teachers in the Ehomba region and our cluster of schools as well as on a wider front across Namibia in showing how the Jolly Phonics can be used to both improve the bilingual capabilities of students. The language development of our children is well ahead of the average for students who have both English and their native language as their indigenous language. We are measuring exciting achievements and enjoy great support from a number of officials who have seen the transformation occur. We continue to make significant investment and are grateful for Chris Jolly and the support of his Jolly Phonics organisation for his generous contribution of materials on an ongoing basis that has allowed this huge progress to be made, both in inspiring the teachers and in benefiting the learners. For those students now in the senior grades at Ehomba, it is very obvious that having been taught in the Jolly Phonics system in the junior school, it has provided significant advantages in their academic capability as they engage in the National Standards Examinations. The school is achieving far higher results that what otherwise would have been the case and even in the senior college which is in its infancy, we are achieving satisfactory results for children who have been raised in such remote circumstances and some of whom have not had access to a full, well equipped and well taught education from their junior years. We had many reasons to celebrate during our visit to Ehomba in July 2014 with great progress being made in making education not only accessibly but also higher quality. The Director of Education (Kunene) has offered Mrs Alexia Zauana the position of official trainer for Jolly Phonics for the region. The two new accommodation blocks for students that the NZ Government Aid programme funded were officially opened by Dame Jenny Shipley, with representatives from the Minister of Education, the Directors of Education in Kunene, and NZ High Commission. The enthusiastic engagement from the community made their support for education and our partnership very clear. This is exciting for the school as more children who wish to avail themselves of the senior school and who live a long distance from Ehomba are able to come and participate. It was a joyous occasion with Ministry officials coming from Windhoek a thousand kilometres away and local people, including the Himba people who danced with joy in response to the opening ceremony (see attached). Since we began working with the school there have been 5 new classrooms added by the Government and the children of this region have access to Grade 8 and 9 for the first time within a 200 kilometre radius. It appears that our original goal to provide education in our area up to Grade 10 is set to become a reality next year. Our goal is to have our pupils eligible to go on to vocational training or to Grade 11 and 12. In 2015 there are already 50 new learners attending school. The 3 day training had a new and expansive dimension. We invited the senior teachers and decision-makers from all over the region to attend this advanced training programme, which focussed on upskilling them to train and instruct their own teams of teachers at their own schools. Schools from every province were represented and the dedication and calibre of these teachers is outstanding. We continue to keep working in partnership with Chris Jolly who has been so generous and supportive in his philanthropic aims to support and spread literacy. Our goal is for the Namibian Ministry of Education to enter a partnership with Jolly Learning, where they will provide training free-of charge and also very generous provision of materials. At the official opening, the representatives of the Education Ministry were able to see first hand the impressive effect Jolly Phonics has made on the quality of teaching, and on the achievement levels of the learners. Training of teachers has been a key feature of this year. Mary Green ran a three day teacher training programme which attracted huge support from the teachers, from Ehomba and the wider cluster. The level of English education competency and reading has dramatically increased over the last three years through Mary’s teaching leadership. We have now trained local phonics lead teachers who are doing a wonderful job, including Mrs Zauana, who is taking the lead role and the programme continues to have an extremely positive impact for the learners at Ehomba school and in the cluster. The new classrooms completed in 2012 are proving a great success. Ehoma school is now up to Grade 9. In 2014 there are two hundred and sixty students at the school, which represents significant role growth. This presents challenges to the school and continues to put strain on the infrastructure, in particular for teachers accommodation and teacher support, but the Trust continues to work with Mr Zauana, the Principal and the teachers to supplement resources where we can. After introducing solar energy to Ehomba School in 2008, we are delighted that the national power line infrastructure has reached Ehomba. While of the solar system served the school immensely well, the reliability of connected power is proving a boom. The teachers have been able to use electrical equipment including photocopiers and DVD’s etc to a much greater extent. It’s an exciting new development, both for school and also for the learners. Having bought three different photocopiers for the school over the last six years, we were delighted in 2013 to see the Namibian Government provide the school with a large photocopier with significant production capacity. It has allowed the school, in its expanded state to meet the learners’ requirements. The two photocopiers that we most recently donated to the school are now in the satellite schools, thus extending the support systems available to teaching staff and providing learning sheets and other opportunities to learners because of this equipment’s availability. The Namibian Government has extended the amount of paper and electricity support to schools, which is making a big difference. The Trust continues to be supported by generous donations from our donors, who from time to time either visit Kunene region and hear about our work in Ehomba, or local friends in New Zealand who are long standing supporters of the project. From time to time, Jenny speaks for organisations where instead of charging consultancy fees, we ask them to make a donation to the Namibian Educational Trust. This has allowed us to continue to do our work without any major fundraising project for the last two years. However, in early 2015 we expect that we will have another major event to both celebrate the progress being made in the project and also allow donors to be updated and participate in the next major project which we need to get underway, which is likely to be a food hall. A major project, but one which I believe is possible with the support we have. More on this later. Africa is on the move. Our grateful thanks to all of you who are interested in watching this small New Zealand contribution to what is a remarkably massive country which is going to be hugely influential in the future one way or another. The children of Ehomba are like children everywhere, filled with hope for the future. There is no doubt in that this generation of young Namibians, who have only enjoyed freedom since 1990 are going to help shape the future of their nation in one way or another. Thank you for your support in allowing their aspirations to come true. Great progress has been made this year since the Namibian Government agreed to extend Ehomba School to a Secondary School. Grade 8 is now being taught there this year for the first time. Children in this region have access to Secondary study for the first time with the exception of the 10 students who we have been supporting on NZ Ehomba Scholarships. The new classrooms, library and science room are behind the children in this photo. Namibian parents have the benefit of knowing how their children’s school is doing amongst its peers. On the last occasion the schools in the north western region were tested for English and maths Ehomba was 29th. This year they are now 4th in their region. This is to the great credit of the teachers who have worked so hard on improving their learning techniques and Mary Green, our founding fellow trust member and lead teacher advisor to the project has run fantastic teacher training programmes on each of our last 3 visits. The results are a thrill to us all and we hope that those of you who have supported the project will take great pleasure from this achievement. Ehomba is attracting more students this year. The roll is now 173. This is a big jump from last year and you will see that a number of the students in grade 1 and 2 are older learners. Just over 50% of eligible children in this area attend school and it often takes a mother months to get the necessary paper work in order for them to enrol a child but finally education is being valued and Ehomba is attracting new student. I have attached the list for your interest and as you will see the learners are in the class at their learning level not with their peers. We are very proud of her achievements! We are delighted to let you know that the NZ Aid programme, from its South African division, is funding the North West Namibian education region to the tune of $100,000 NZ to have a new boys and a new girls hostel built at Ehomba. Miss Bernadette Jagger, the Deputy Director of Education for the region will oversee the project. With the rapid rise in numbers of learners this year this will be so welcomed by the teachers and learners alike. If children live within 5kms of the school they must walk each day. Children who live further afield can board for the school week in what are former army hostels. There are nowhere near enough beds for the learners so they double and triple bunk. This New Zealand gift for the buildings and some of the bunks and mattresses will add enormously to the life of the learners at the school. The hostels are expected to be built over the next 9 months and we will report on progress as it occurs. Burton, Jenny, Garry and Mary Green and their daughter Shannon will visit Namibia in the second half of August. As always the trust does not contribute in any way to our visit. All the funds we raise go to the children, the teachers and the children and teachers of the wider cluster who feed in children to Ehomba School. Overall we are working as our primary focus with the teachers and learners at Ehomba but provide some support to another 30 teacher and 400 plus learner in the wide region. We are taking all sorts of materials for the school this year and will make an assessment on what we can most usefully do to assist the Grade 8s and the senior schools development while still investing in all levels. We will let you know what the next priorities for fund raising are in due course based on what we discover this time. There is still plenty to do. One thing we hope to solve are the cooking facilities and the food programme. Currently the children have one PAP meal a day and some supplement from the garden in the growing season. And things do grow. We planted 5 banana trees 3 years ago and they have continued to propagate them and have almost established a grove. They produce very well in season and the children would not dream of touching them unless they were shared out amongst all the learners. The livestock in the district are not so polite but the garden is well fenced thanks to the trusts efforts and they children lock the gate with religious zeal! Clearly the scarecrow will need attention this year during our visit. This year is the first year where Ehomba is taking grade 8 students. The children who graduated from grade 7 last year remain at Ehomba. So the children we have supported on scholarship historically continue in their programmes at large, but in the future children will have the opportunity to complete their secondary schooling in their own region. This is a very important development for the children of this area. Up until now children within a circumference of over 200 kms have had no secondary school facility for these young learners to go to with the exception of the 2 scholarships for girls and 2 scholarships for boys that the trust offered each year. Already the school roll has jumped from 135 to 160 and estimates are that that will continue to sky rocket as it becomes obvious that Ehomba is to be a secondary school now and in the future. We are very proud of the leadership of Mr Zauana and the teachers involved. No one should under-estimate the hardship of implementing steps such as these in such a remote part of a country like Namibia. A commitment of these teachers to their learners, and to the future educational needs of Namibian children is frankly something to behold and it’s our privilege to work with them in some small way that makes their task more rewarding. We deeply appreciate the support of our donors who assist us in allowing this to happen. A very exciting new step has occurred this year with the Namibian Government finally agreeing to upgrade Ehomba School to a secondary school. As part of that commitment four new classrooms are currently being built. The builders are on site creating great excitement for the learns and teachers alike. This is a very remote part of Namibia so building anything in this environment is challenging, but there was no Placemakers down the road if you have forgotten something. The nearest hardware facility with building equipment is 160 kms away. The four classrooms will include two teaching classrooms, a laboratory/computer room, and a library. These are exciting developments for the school and we will keep you up to date as they are completed. The garden continues to thrive. The learners take a great interest in it individually. Also each class has at least one if not more plots and there is fierce competition about who can grow the most, while keeping their garden area in order. The children guard the perimeter of the garden with great diligence. It is very well fenced. But there is a chain and padlock on the gate to send the serious message that if you are not authorised to be in the garden, you shouldn’t be in there. Equally the goats and donkeys of the district have got the message! if they can get into the school yard they bolt toward the garden precinct knowing the delicious delights that await them if somebody had inadvertently forgotten to close the gate. The motivation for the children to see that that doesn’t happen is high. The garden is now providing food for three nights a week for children who up until the establishment of the garden were having only one meal of pap a day. They are very proud of their achievement and have made great progress and commitment in working in the garden to their mutual benefit. The banana grove that we planted three years ago is continuing to flourish, and this year has again produced very large crops of bananas that the children share diligently. No one would dare touch a banana unless it is with the agreement of the whole and then they cut them up and share them in a way that would make most New Zealand children perplexed and I suspect humbled. Another exciting development is the establishment of a pre-school class to try and get children, many of whom haven’t held a pencil or drawn on paper at the time that they come to school more familiar with the learning environment. A very talented young teacher is now leading this group and the numbers of littlies starting to turn up at school is significantly increasing, which as they flow through the school pipeline will increase the numbers at the school overall. Mrs Zauana one of our lead teachers in the junior school at Ehomba is being supported by the Trust for a one year study programme in Windhoek the capital of Namibia. Mrs Zauana is a outstanding lead teacher. She has taken great interest and leadership responsibility in the teaching of phonics which we have introduced to the school to assist with their teaching and learning of English as a second language. She is a leader not only within Ehomba but within the cluster which benefits well over the 600 children in the immediate region and then others further afield who she has included in her phonics workshops. We believe that by the Trust supporting this year long advanced teacher qualification component to her current qualification that she will be more able to lead in the teaching of English, and not only in the junior school, but also in the senior school at Ehomba in the future. Mr Zauana is looking after their children and leading the school with the support of other locals, while Mrs Zauana is in Windhoek. Windhoek is 1,000 kms away from Ehomba, so this is an enormous personal commitment from the family in order to make this achievement possible. The Trust has been pleased to fund both the tuition and boarding costs associated with Mrs Zauana’s study. We recently had a wonderful day in Rotorua, along with 12,000 others, watching Namibia play Fiji. We were dressed for the occasion! It was a great game won finally by Fiji 49 to 25. It was marked by good sportsmanship, a good humoured crowd, a wonderfully managed site and fast flowing rugby. We had met the team in Namibia so greeted them from the tunnel edge. All in all a neat day out and we were proud of our association with these spirited people.